WICCA’S WARDROBE will now be known as WICCA’S ORIGINALS! Home » wiccamerlin » WICCA’S WARDROBE will now be known as WICCA’S ORIGINALS! We have done a soft roll out of our rebranding as Wicca’s Originals and now it is time to truly make it official. On March 2nd from 2pm to 4pm SLT we will be having a party with live music, gift card raffle, and a mini hunt to celebrate making our rebranding official. 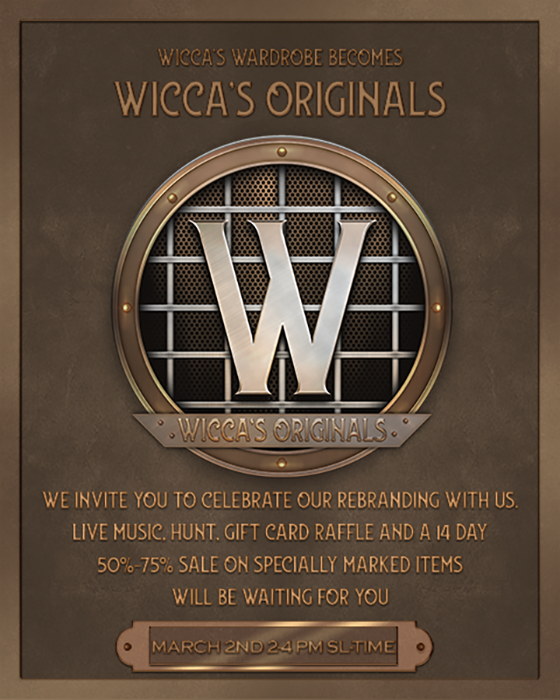 All of our marketing and packaging will be using our new Wicca’s Originals logo (including HUDs, gacha machines, vendors, etc), and our store will be changing to reflect our new look as well. The mini hunt at the party will last for two weeks and a group membership is required to participate. We will also be having a huge retirement sale where we will be marking down selected items by 50 – 75%. Even older group gifts will be retired so a group membership is well worth it! Our group will be free to join starting at the party and through the duration of the hunt. We look forward to you joining in our celebration on March 2, 2019 @ 2pm SLT!